* Sep 1st – Draft order will be determined randomly 1 hour prior to draft as per ESPN (5:45PM PST). The FantasyPro.Football League will not have divisions or conferences when played in a 12 or 14 team format. All teams are placed in a single (1) division. This ensures the teams with the top 4 head-to-head records will advance to the playoffs. Responsible for conducting league business, arbitrating league disputes, the running of all drafts, and ensuring correct weekly line-ups have been posted. 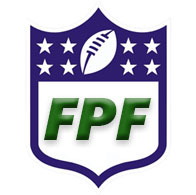 The League Commissioner will be required to be completely FPF conversant prior to each season starting, must pay for (will be reimbursed from league fees), and download the FPF software (if applicable), and setup the league for uploading to the FPF site. The Treasurer will set up and maintain the leaguesafe.com website, receive and record all league fees, and be responsible for league payouts. If no owners volunteer to be league treasurer, the commish will inherit these responsibilities. League Rules will be reviewed annually during the month of August. Major rule changes can only be made through a league-wide vote requiring 75% yes votes for passage with a minimum of 75% votes being cast. In-season votes, though discouraged, require 100% majority votes to pass with a minimum of 75% votes being cast. The commish reserves the right to define which rules constitute a major rule change. Votes will normally be conducted on the FantasyPro.Football Message Board. Off-season votes will be conducted or at least started through email. In-season votes are due within 48 hours of the time posted at the forum. During these time frames, if the required votes are not cast, the time frame will not be extended and the vote will be considered to have failed. Any decision made by The League Commissioner will be posted on the message board immediately and may be brought to a vote if 4 or more owners request a league wide vote. 75% votes will be required to overturn a Commissioner ruling with a minimum of 75% votes cast. Waiver Fees: Waiver Pickup $2.00 per transaction (this fund will constitute the transactions fees). ($1 to drop/$1 to add). *Transaction bonuses are calculated at $2/transaction and paid out only for transactions in excess of the prepaid transactions. The commissioner reserves the right to debit/delay transaction payouts as needed due to unforeseen circumstances (delinquent owner, etc). An owner may not own more than one franchise. Owners can name their franchise whatever they choose. However, no owner may use language considered obscene, offensive, or insensitive. 4 letter words are not acceptable, but being suggestive is. The League Commissioner and ultimately ESPN will have the final say on what is allowed and what is not. The cost to own a PPFL franchise is $120.00. This includes $100 league fee and $20 for 10 prepaid transactions (additional transactions may be purchased at $2/ea but refunds will not be given for the $20 of prepaid transactions.) Payment is due as indicated in the league rules or posted on the league website. The commissioner reserves the right to change the franchise fee from season to season without a league vote provided the fee is within the threshold of $75 to $150. Absent extreme circumstances, such as a medical emergency (subject to league 2/3 vote), there will be no refunds of league fees. Paying league fees implies a commitment to run the team for the full season. In the event an owner goes delinquent on 50% or more of their league fee for more than 90 days, they will be subject to a league ban until the unpaid portion has been remedied. Current franchises on league ban: Cody Clifton (Seattle’s Finest); Note: Stephen Moody (Moody Blues) was removed from the ban list in 2014 after repaying his debt. season, or isn’t heard from by the payment due date, a replacement owner will be sought. Replacements will be recruited through personal invite and voted in, and the original owner will not be refunded. Once a confirmation has been received by the League Commissioner of a persons interest, a league- wide email will be sent for a “Replacement Owner Vote”. A vote of 75% yes votes of ALL remaining league owners will be required to approve any replacement owner. If 75% is not reached, the search for a replacement owner will continue using the same format. Owners conducting themselves in a way perceived to be detrimental to the good of the league may be removed by a vote of ¾ majority of owners. If an abandoned team is in the bottom half of the league a surrogate owner may be allowed to play in the league without the franchise fee for the remainder of the year. FAAB Dollars are the official currency of the FantasyPro.Football league when bidding on free agents. FAAB Dollars not used during the season are not carried over to the following season. Each team will be awarded a total of $1000 FAAB Dollars upon completion of the draft for which they can use on bidding for free agents during the entire season. Once these bidding dollars are spent there is no replenishment until next season so spend wisely. Please keep in mind a $2/transaction fee will be added to team’s balance as well. Each franchise will maintain an in-season active roster with a maximum of 17 players for a 12 or 14 team league. In the event of a 16 team league, rosters will be reduced to 16 players. It is the owners’ decision on how many players to carry at each position though the league settings limit the maximum number of players at each individual position. Each franchise will have the opportunity to place a player who is on the real life injured reserve into an injured reserve slot on their own team. Only 1 injured reserve spot per franchise is allowed. Adding/removing IR players will follow ESPN rules. Moving a player to injured reserve will count as a transaction and is subject to the $1 fee. Moving said player back to the active roster will not incur a fee but dropping the player will constitute the standard $1 drop fee. FA is a weekly process that occurs on Wednesday morning at 12 AM Pacific Time. After the first period of waivers, transactions are on a first come first serve basis (with dropped players moving to waivers per ESPN). Owners are advised to get their picks in early to the ESPN website to prevent technical difficulties from affecting their weekly adds/drops. The FA weekly process will be conducted in a *blind auction* manner per ESPN’s “Free Agent Auction Bidding” setting with bids being processed on Wednesday at approximately 12:00AM PST. Players who are not claimed during bid processing become free agents available for first come, first serve style pickups until they lock at approximately 5 minutes prior to kickoff of the week’s game for that respective player (or per ESPN lock rules). FAAB Dollars are used to bid on free agents and each franchise is allotted $1000 FAAB to be budgeted for the entire season. The minimum FA bid for FAAB waivers is 1 FAAB Dollar. Teams may only bid up to the amount of FAAB Dollars they have available. Bids must be in whole number increments. If the maximum total of all possible bids exceeds the team’s FAAB dollar balance, transactions will be nullified from last to first until the limit is met (as per ESPN guidelines). Bids for FA’s must be submitted through the league site on ESPN. Bids received by any other means will be rejected. Waiver order is determined initially per ESPN by draft order. As waivers are fulfilled by franchise player acquisitions, teams with successful bids are moved to last in the waiver order per the ESPN website. All FA pickups will be on your roster until the end of the season unless dropped by the owner. Players dropped will be on waivers for a period of 1 day before being subject to being reaquired via the bidding process. Players added and dropped on the same day will not be subject to waivers. FPF will observe ESPN’s undroppable players list. These are generally players that are so valuable with their points contributions, dropping them in a H2H Points league would constitute franchise sabotage on behalf of the owner. If a franchise waives a player and wishes to reclaim that player, the franchise must have the winning bid in the blind auction to re-obtain him. ESPN rules will apply for reaquisition. Trading of players is not permitted in FantasyPro.football. This rule supercedes any other references to trading on the website or rules. The length of the regular season will be 14 weeks, the playoffs will consist of 2 single week scoring periods. Weekly league games and playoff games will be played head-to-head against opposing franchises (H2H Points Format). The playoffs will consist of 2 single week periods during NFL week 15 and 16. There is no FPF play during week 17 due to the number of top tier players who sit during week 17 in a typical NFL season. The deadline for naming starters is set by FantasyPro.Football rules, but generally a player is locked approximately 5 minutes before kick-off. On Wednesday or Thursday night games, only those players in that night’s game must be submitted. The rest of the lineup will not be due until approximately 5 minutes prior tothat Player’s respective game. If no lineup is submitted, the owner will be forced to use the previous week’s line-up (If week 1 the owner will receive zero points for that week). The lineup for each week will default to the previous week’s lineup. There will be noexcuse accepted for non-submitted line-ups. Owners continuously submitting line-ups with bye or injuredplayers will be subject to rule 2.3. Players can only be inserted into a starting line-up at a position for which they are listed on their NFL teams depth chart. The official source for player positions is ESPN.com. Scoring will follow a modified version of the ESPN .5 PPR scoring format. The format is designed to somewhat mimic the original PPFL/WCOFF scoring format but with .5 PPR. The team with the highest weekly point total by their starters is the winner for that week’s H2H matchup. Tiebreakers will be determined by most bench points. ESPN has the ultimate authority for statistics and scoring and normal scoring revisions my reverse the outcomes for close games. (16) with the Platinum Bowl and Runner-up bowl. Week 16 – Platinum-Bowl: the previous week playoff winners play eachother. Consolation-Bowl is the previous week’s losers playing eachother. This format mimics the NFL playoffs in that any seed can win the Platinum Bowl. In addition to the Platinum Bowl, the Platinum Cup will be awarded beginning in 2015-2016 based on the top scoring franchise over the entire season (including playoffs). Continuing the tradition of MFL’s Victory Point structure, FPF will award an equal purse to the top scoring team (see payout structure in 1.7). Other bonuses include the #2 scoring team, each week’s highman (see 5.5.5) and the highest single week scoring for the season. These points-based bonuses keep franchises competing for prizes through the season when they may have been mathmatically eliminated from the playoffs. The top scoring franchise each week will receive a cash bonus credited to their account based on the payout structure in 1.7. If two teams tie for the top score during a given week, the highman bonus will be split evenly between the 2 teams. The commish reserves the right to stop the draft timer at the draft in the event of an emergency or technical issue with an onsite drafter. If a drafter is drafting remotely, the commish will not stop the draft timer so please take care that you have tested your system prior to the draft and have a reliable internet connection. The commish also reserves the right to draft for another team if the owner asks prior to the draft. The FPF Draft will consist of 17 rounds for 12 and 14 team leagues. The FPF Draft will be limited to 16 rounds in a 16 team league year. Draft order in subsequent rounds will be in the “snake” format.